Are you an author wishing you could sell more copies of your book? There’s a huge market just waiting for you out there – if you put your book together the right way and know how to market it to these buyers. I’m talking about librarians. There are about 120,000 libraries in the US, and they spend billions of dollars for acquiring books every year. Excited by this news? My new book is for you! This is the only book of its kind – written by a iibrarian – a librarian with over twenty years’ experience in public, academic, non-profit and trade association libraries – big and small. This is the only book that will show you exactly how to create the kind of book that librarians will be most likely to buy. This is the only book with a detailed, comprehensive approach, proven to work, for selling your book to librarians. 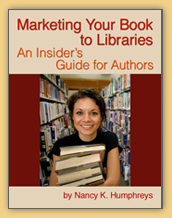 Marketing Your Book to Libraries: An Insider’s Guide for Authors, Instant download PDF, 153 pages, on sale now for $19.95. Note: when you click this button, you’ll be on a shopping cart page where a PayPal button will enable you to choose to pay via PayPal or a credit card. Imagine that you know exactly how to sell dozens, hundreds, even thousands of copies of your book regardless of whether your book is new or old, e-book or hard copy. With my guide you can make book sales that put money in your pocket month after month and get your book into the hands of readers who will help you sell it to others. I’ve been a struggling author. I know first-hand how frustrating it is to have spent months and years writing a book, only to get a pittance in royalties while a publisher does little to promote my work. I’ve self-published, and I know that’s not an easy road either, even these days. You can’t just walk into a library and hope they will take your book, not even if you’re giving it away! Librarians are happy to get books, but they also have constraints on what books they can accept. Libraries have policies that tell librarians what they can and cannot buy. Space and the high cost of storing and/or distributing books to library patrons is another huge limitation. Time is another issue for librarians – believe it or not, librarians have little time at work to spend reading about books. As a result, the book world has developed a a system to serve the special needs of librarians who buy books. This system consists of “gatekeepers” you must get past to get your book into libraries. This system isn’t difficult to understand, but you do need to know the details of how it works to make the most sales your book to libraries that you can. There are over 122,000 libraries in the USA.If only 1% of them purchased a copy of your book, what kind of a difference will these sales make to your bottom line? How about 5% of them? Or 10%? Whether you are a published or self-published author, my guide shows you exactly how to create step-by-step plan to prepare your book for sale to libraries, to target the libraries that will be interested in your work, and to create a marketing plan to reach exactly those librarians who will purchase your book. Get your copy of my new book, Marketing Your Book to Libraries: An Insider’s Guide for Authors and get ready right now to sell your book to libraries, the biggest hidden book market in the US and possibly, the world. To buy and download this book now while it’s on sale for 20% less, click on the button below!Marketing Your Book to Libraries: An Insider’s Guide for Authors, Instant download PDF, 153 pages, regular price $24.95, on sale now at $19.95! Think self-publishers can’t market to libraries? That you have to wait until your book garners enough sales before librarians will look at your book? NOT at all! I’ll show you how to identify which librarians would be most likely to buy your self-published book, how to get their attention, and meet their guidelines. Part of your marketing strategy will include identifying and contacting the exact librarians who will want your book. Think your publisher will take care of marketing your book to libraries? Not! If you’re seeking a publisher, I’ll show what kinds of publishers there are and how to identify the publishers with the best chance of selling your book to libraries. You’ll learn how to coordinate your own marketing with your publisher’s efforts, while you also reach the librarians your publisher doesn’t. No publisher has the time or motivation to market your book to libraries as well as you can! And, my guide will help you make sales to the general public as well as to librarians. Expert marketers will tell you that “word-of-mouth” marketing is the best way to sell a book. Library patrons in the US outnumber Amazon customers by 5 to 1. Long after you publish your book, library patrons will be mentioning your book to others who might buy it. Attract readers’ attention when your book is in the library catalog and on the library shelf, and you can be making sales of your book for years! Along with loads of active links to resources on the Web, here are thirteen “Prep Work” activities in my guide that will walk you through creating a library marketing plan for your book—even if you haven’t finished your book yet. My guide is a unique, in-depth, insider’s look at how the library world works. It tells you everything you need to know to sell your book to the biggest book market in the US. Libraries are a book market that is invisible. Sales of books to libraries are not included in the bookstore statistics collected by BookScan or used for compiling bestseller lists. Yet, statistics show that libraries are much bigger market than bookstores. Libraries are a very competitive market to be sure, but they are a HUGE market that spends billions of dollars on books each year. This is a market worth breaking into. Even if you’ve written an ebook, an audiobook, a video book, app book, graphic novel, or your book is a PDF book, you can market it to libraries. Librarians will buy materials they believe their patrons will want to read… and with my guide, you’ll know precisely who to target, and you’ll be ready with exactly the information they need in order to purchase. To buy and download this book now while it is on sale for 20% less, click on the button below! Marketing Your Book to Libraries: An Insider’s Guide for Authors, Instant download PDF, 153 pages, regularly $24.95, on sale now for $19.95! Don’t waste another moment — begin marketing your book today!